What makes Stewart Construction unique? Stewart Construction approaches projects from a unique point of view — yours. You might be concerned about the constraints of your project: time, ongoing operations, cost, noise, environmental issues and more. Our extensive background in complex projects gives us the knowledge and confidence to address these issues. Our goal is to make your project on time, on budget and better than you ever imagined. What if we have a very short time frame? Stewart Construction is unique because our experience, attitude and employees are exceptionally suited to time-sensitive projects. IBM’s Building 610, a vast renovation of 60,000 ft2, including state-of-the-art technology, research and security systems, needed to be completed in 14 weeks. Stewart arranged for around the clock shifts and worked intensely on a schedule that allowed multiple subcontractors to work on the project at the same time. What if we need to keep operating during construction? Stewart Construction is highly skilled at working around existing operations. In fact, for many of our clients, this is a key issue, and we have many tools to ensure minimal disruption to ongoing operations. Fletcher Allen’s Central Sterile Reprocessing renovation needed continued operations 16 hours per day, 7 days a week. Additionally, we needed to maintain a completely sterile environment during every phase of the project. Whether your project needs quiet construction, night construction or space management, we can make it happen. What if we are concerned about environmental issues, like energy efficiency? At Stewart, we strive to keep up to date on eco-friendly products and processes. The green product field is, thankfully, growing rapidly and we stay on top of those trends. Our clients that require environmentally sensitive processes, including remediation, alternative energy and insulation can have confidence in our knowledge and experience. One project, at the Vermont Natural Resources Council, not only required us to follow guidelines for historic renovation, but minimize the environmental impact of both the construction process and the building itself. We are experienced in a wide variety of projects, from small renovations to large new construction projects. We do extensive work in many fields, including commercial, medical, educational, religious, and historic. In fact, many of our projects are quite complex and involve different types of construction and management. For example, many of our affordable housing projects with Housing Vermont were in historic buildings and some include commercial space, as in Vergennes. Yes! In an average year, 80% of our projects are for repeat clients. See our client list. In fact, we have done over 60 projects for FAHC, nine projects with Housing Vermont, numerous projects with the State of Vermont, three projects for Middlebury College, multiple renovations and additions for Jager Di Paola Kemp and several projects for Burton Snowboards. Our longest client relationship, with JDK, spans 15 years and some of our subcontractors have been with us since we started, 20 years ago! We see this as a testament to our integrity, reliability, efficiency and innovation. 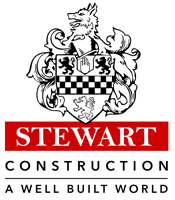 How big is Stewart Construction? Stewart employs 25 carpenters, laborers and office support staff, and uses over 100 subcontractors. Our employees are consistently praised for their leadership, insight and flexibility. Our bonds are secured through International Fidelity and Insurance. Please contact us if you would like us to send you a copy of our AIA 305 Contractors Qualification Statement. To discuss your upcoming projects, contact our President, Don Stewart, or our Senior Estimator, Lance Triebel.